It’s not all bridal bouquets and buttonholes here, you know, sometimes we throw other celebrations in the mix to keep ourselves on our toes. One of our most recent parties was a woodland baby shower, themed very loosely around cute animals and delicate pastel flowers. 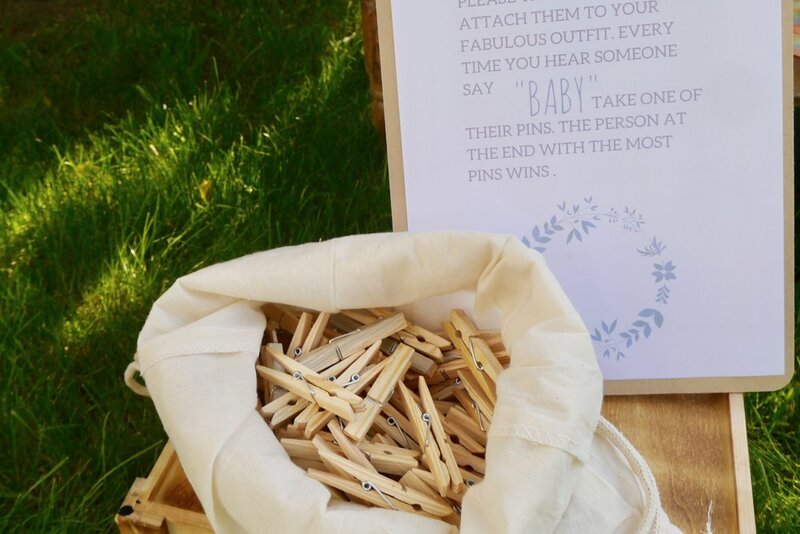 After finishing up working on our woodland baby shower we thought you might like to get your hands on some free printable baby shower games with answer keys, to help your own planning go just the little bit more smoothly. We’ve made the download gender neutral, to suit any shower, and have included all the games we played at our party, as well as including answers. Obviously to make the PDF usable for everyone, we’ve kept things generic with no name specifics. However, if you’re keen to have a go yourself then we just used Canva, which has a super simple graphic design site with a drag and drop formula – and it’s free to! Grab the link to the download at the bottom of this page. Below are a few of the elements from the day explained in more a little more detail, but if there’s anything you want to more about specifically, feel free to send us an email. We’re always happy to answer questions. 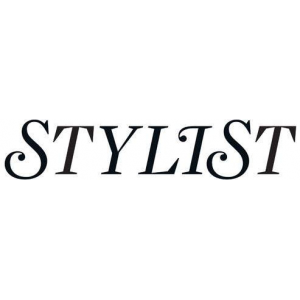 Where possible we've included links to the products used too. 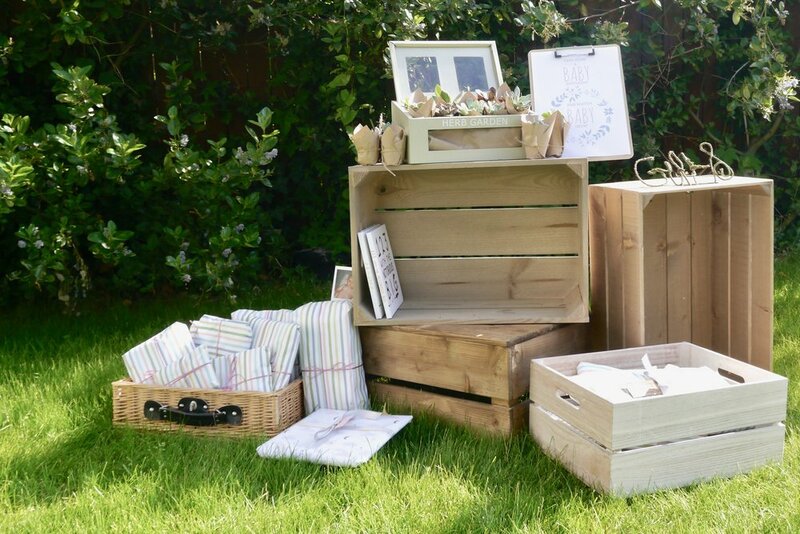 Once we had decided we wanted the woodland baby shower to be outside, we knew that we wanted to have a pretty picnic with all our pals. 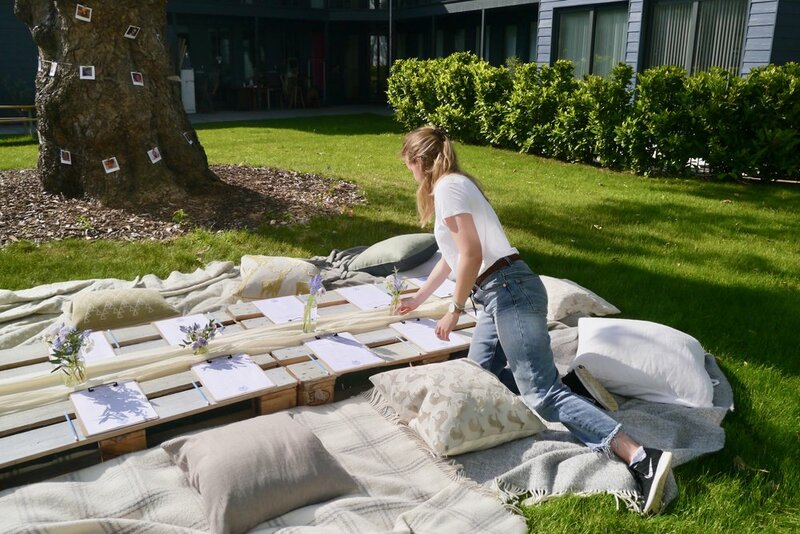 We’d seen some of these snazzy picnic tables made out of palettes on Pinterest, so who were we to fight what was already a tried and tested approach? Nobody, that’s who. So we went for it. First thing was first, the intricate art of palette hunting. Off we set around bins and street corners until we had our mucky little paws on six substantially sized palettes. The learning here is that palettes come in all shapes and sizes, so try and source ones the same width, so they match up perfectly as a complete table. If you can’t find palettes hanging about your local streets, then you can usually pick them up from Gumtree, Freecycle or places like timber yards. Have a little scout about and see what you can find. There are places selling them, which in a moment of madness we considered, but for every person selling palettes there are five people trying to give them away for free – so if you’ve planned things well enough in advance you should be fine to find freebies. 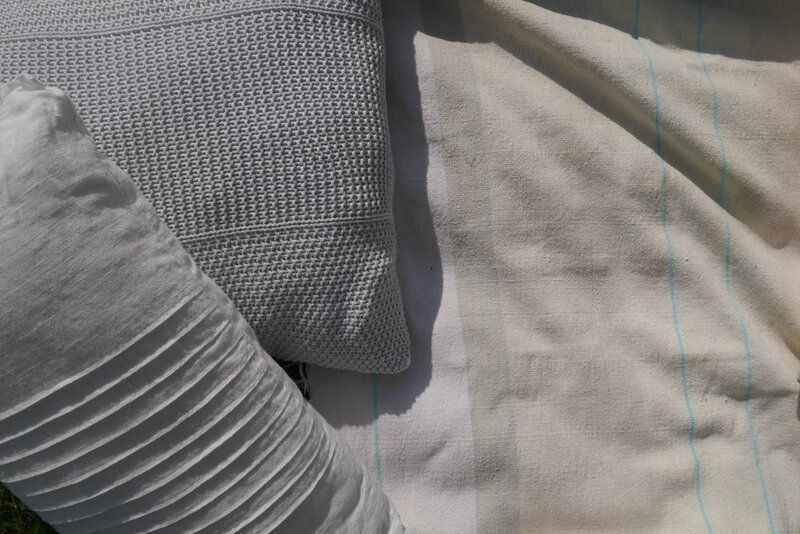 Next we painted them in soft tones of grey and cream, to act as a neutral base to our picnic. We only painted the top as to do the hole things would take a whole hunk of paint, and nobody will really notice if the bottoms of your palettes aren’t pained (and if they do notice, well they’re not the kind of people you need in your life). Finally we just laid them end-to-end to create one long picnic table, finishing it off with a runner of soft, cream muslin to add a little texture and movement. For the activity stations we didn’t even paint the palettes. We just bought a roll of cheap brown paper and stapled that across the palettes to make a make-shift top that we could tear off and throw away at the end of the day. Nobody likes forced fun, so we tried to keep the high-energy compulsory games to a minimum while also trying to make sure everyone had enough to do during the afternoon. The answer? A handful of quick and easy baby shower games. For us there’s nothing that fills us with more dread than the thought of that chocolate-in-the-nappy game, where you have to guess the smeared filling. Equally things like ‘guess the size of the bump using this piece of string’ can make expectant mammas feel a little less than fabulous. 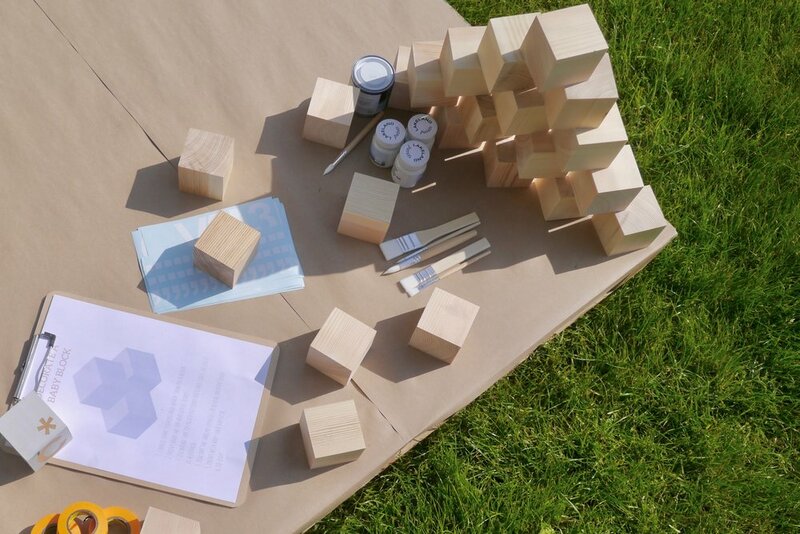 Homemade baby blocks: we bought 2.5inch wooden blocks online, and bought 24 so that each person at the party would be able to decorate one. We then bought a packet of 2inch white vinyl letters and numbers to decorate the blocks with. Next up we got ourselves some masking tape in different widths, some non-toxic paint and some baby-friendly sealant, just in case one day they were shoved in a mouth for one reason or another! We also picked up a pack of good old Ikea paint brushes. One thing we would say, is that the baby blocks have quite sharp edges, so probably are better for a nursery decoration rather than a toy, until the baby’s a bit older. We laid everything out with instructions, which are included in our free download, and left everyone to get creative. Some people went freehand, but the stickers are a great way to get pretty results without any artistic talents whatsoever (looking at you, Jess). A learning from the day is that we let everyone go at their own pace, which is obviously lovely, but it meant some of the blocks weren’t 100% dry by the end. If we did it again we’d kick this off first, to give everyone enough time to decorate and dry their blocks. Finally we bought a simple cotton bag to pop all the blocks in to let the lovely mamma take them home. 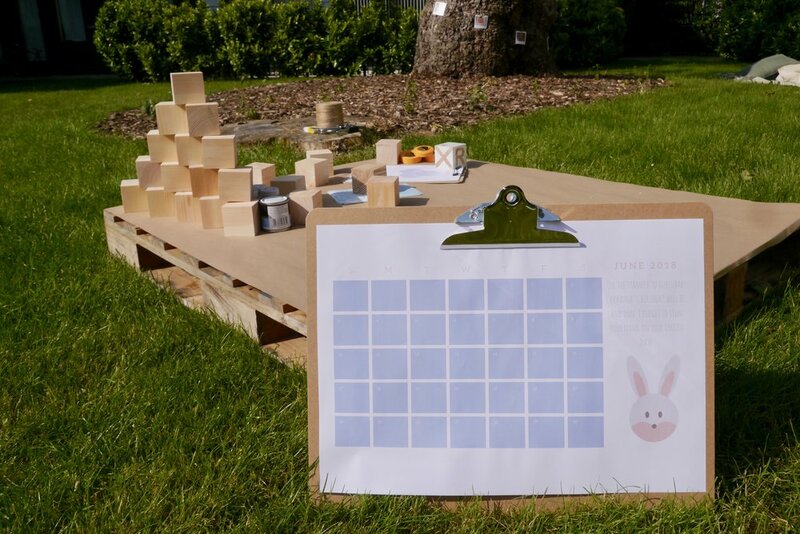 Baby shower calendar game: This one has to be the oldest baby shower game in the book. We made our own personalised calendar, provided stampers and asked all the girls there to guess the due date. Another learning: We popped this on the same table as the blocks and some of our little stampers ended up being used for some seriously spontaneous block painting. So maybe keeping practical crafting separate would be better to make sure the right wee bits are used for the right games. We bought a light grey ink, some alphabet stampers and a little wreath and heart for people to use, too. Late night nappies: This was just about the only nappy game we could get our heads around (maybe we’re prudes. Actually, we’re definitely prudes). 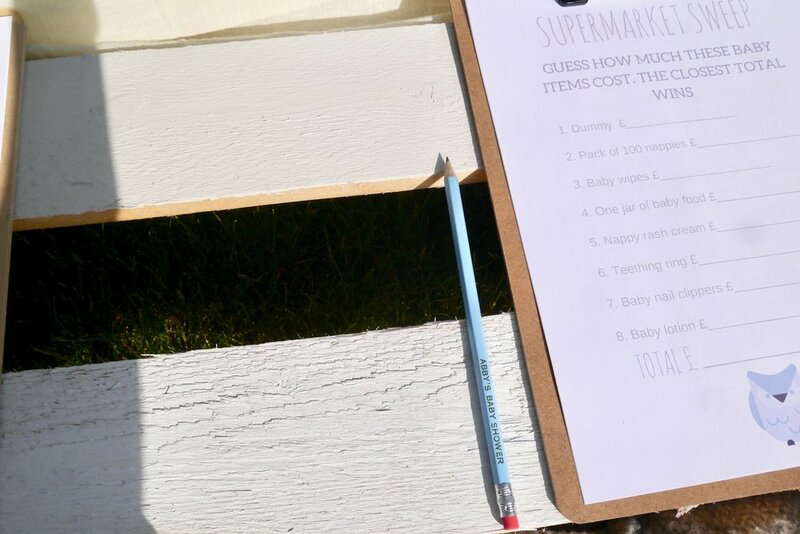 But anyway, this little quick and easy baby shower game involves writing some funny messages on a bundle of new-born nappies to help mum and dad get through the first few sleepless nights when they’ll no doubt be up and down a dozen times a night. All that we needed for this one was a few sharpies and a handful of nappies. Job done. 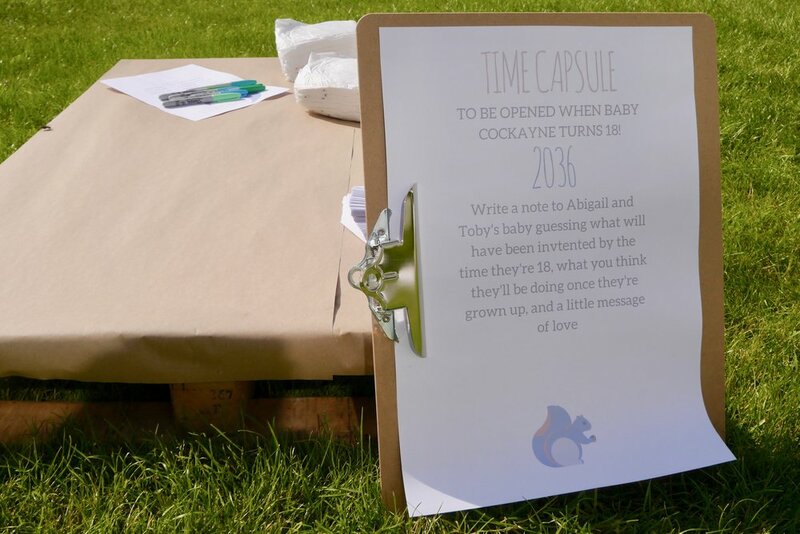 Time Capsule: This baby shower game is definitely a slow-burner, given that you’re meant to wait 18 years to read the results, but you know – some people are more patient than others. We bought a packet of thick white notecards and matching envelopes, threw some pens down with a few instructions of the kinds of things to include and let people get on with it. To make it a little more personal we also took Polaroid snaps of each person with our gorgeous expectant mum to pop in with their message. 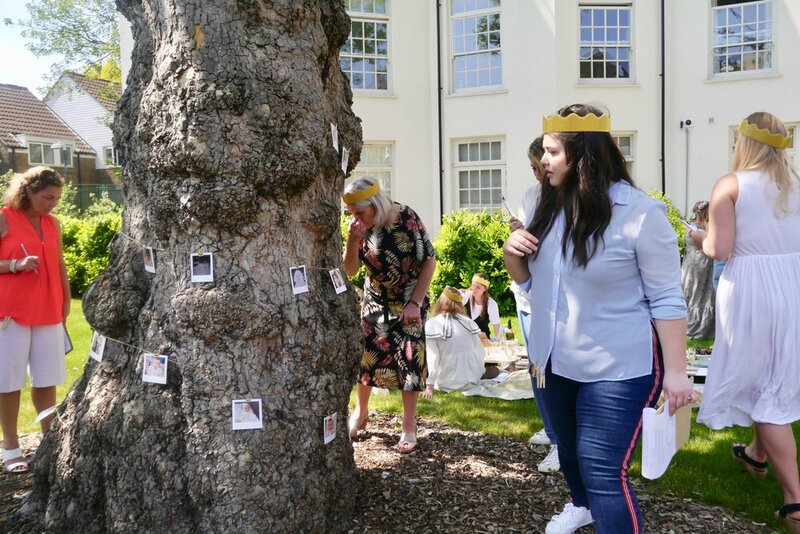 ‘Who’s that?’ baby shower game: It’s a classic, and you probably have already heard of this one. Get all your girls or boys to send in a picture of them as a baby, hang them up somewhere with a number each and get everyone to guess which grown up matches which baby picture. We strung ours on some twine and attached with mini bulldog clips. We also had all the pictures printed to look like Polaroids, so that they matched. Because those are the kind of OCD girls we are. Sorry about it. Baby baby game: This little number requires everyone to tag two pegs onto their outfits. All guests are then banned from saying ‘baby’, and if someone does say it, whoever they’re talking to can pinch their peg. The person at the end of the day with the most pegs wins a prize (gin in our case, obviously). For some reason we thought it was IMPERITIVE we had a cake for the party, because what’s a party without cake? With that existential question ringing in our ears we looked up a good solid three-tiered chocolate cake recipe, whipped it up ahead of time and then defrosted and iced it on the day. 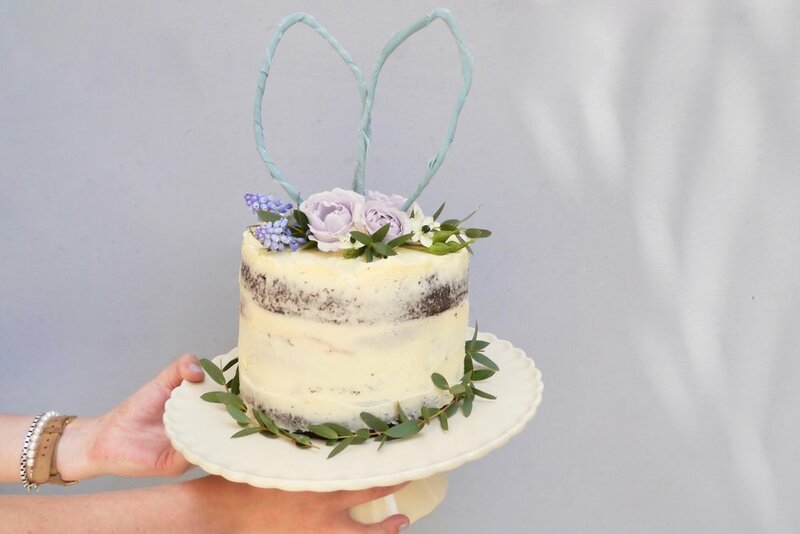 We picked a white buttercream for the outside and topped it with a few frsh flowers and some little bunny ears. The ears were made from wire, simply wrapped in some beautiful Kate Cullen silk ribbon. This is the most unnecessary detail there ever was, but if you’re feeling extra as well then you might like to get your paws on some personalised pencils. We got ours from ebay, and they really aren’t as expensive as you might think, plus they actually turned out to be a lovely little keepsake for people to take away. When it came to the grub, we knew we wanted our baby shower food ideas to be simple to put together, but also be crowd-pleasers. We went for a selection of sandwiches and then lots of shop-bought things decanted into pretty containers to pep them up a bit. The full line up included cheese and pickle, ham and mustard, and cucumber and mayonnaise sandwiches, crudities, breadsticks, houmous, beetroot dip, tzatziki, crisps, fruit wedges, homemade brownies (pre-baked and frozen), chocolate fingers and ‘baby’ doughnuts brought by one of the guests – the lovely Ellie from The Wedding Enthusiast. 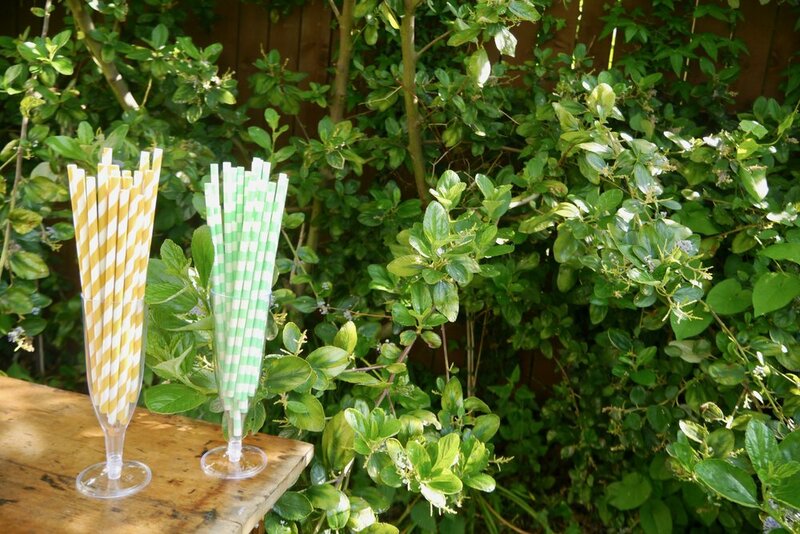 We served up prosecco, Pimm’s in drinks dispensers and virgin G&T’s so mamma didn’t feel left out. These are another completely unnecessary element for the day, but they turned out to be one of our favourites. We bought some cheap baby bottles from Aldi and spray painted them in gold, silver and bronze spray paint. These were given out to the winners of the games, along with a bottle of something alcoholic too! We couldn’t throw a baby shower without including a little plant or two, could we now? 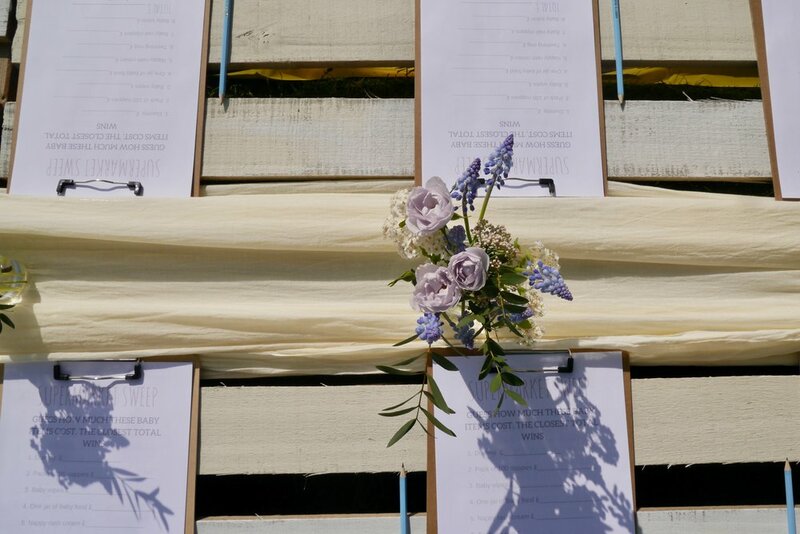 We picked up a tray of mini succulents from the market, wrapped them in brown paper and string and gave one to each guest as they were leaving. 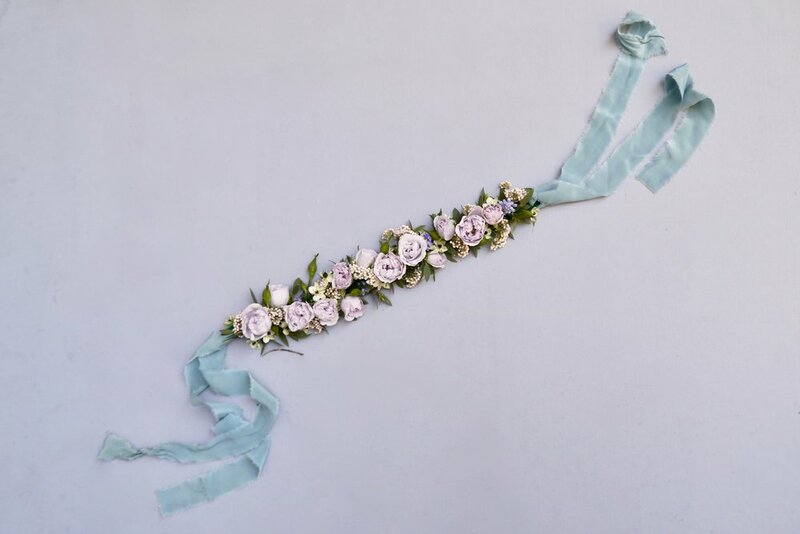 We wanted to throw together quick DIY baby shower centrepieces, so we plumped for classic little jam jars of flowers. 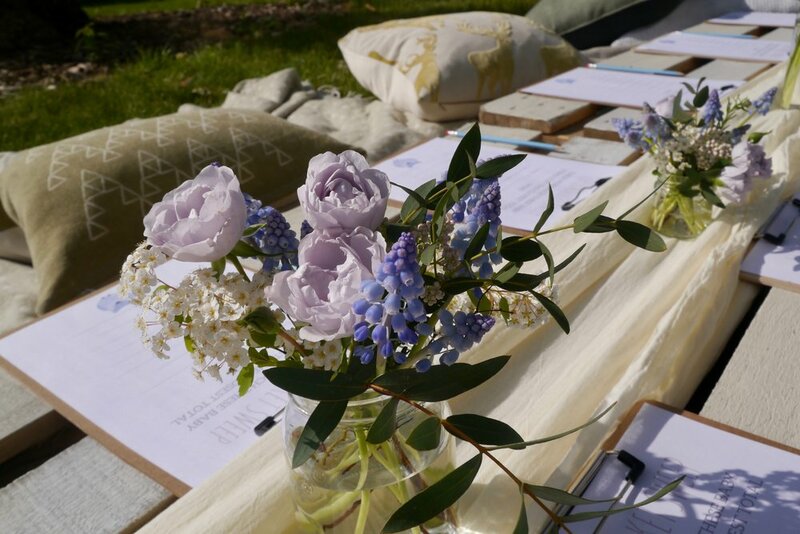 We chose beautiful blue and dusty lilac flowers from the market – which included muscari, spray roses, blossom and eucalyptus. These were simply chopped down to size, popped in some jam jars and laid along the centre of the table.